Air Canada hit the headlines of aviation media as the curtain was lifted over the brand new international travel cabins of the first Boeing 787 Dreamliner which arrived in Toronto on Sunday. Air Canada’s Boeing 787 Dreamliner has three travel cabins – International Business Class, Premium Economy and Economy – with world-class cabin architecture, a la modish interior design, and plush seating in compliance with the airline’s commitment to redefine inflight luxury and enhance travel experience from time to time. Air Canada will have had 37 Boeing 787 Dreamliners to expand its wide-body fleet in keeping with the latest aviation technology by the end of 2019. The International Business Class cabin is equipped with ergonomically designed Executive Pods which come with flexibly adjustable cushions and headrests integrating massage-functioning features. The seats can be rolled out to 180-degree and 80-in full-flat beds. High-tech entertainment systems with 18-in screen will be installed in the International Business Class to let passengers spend time in luxury. 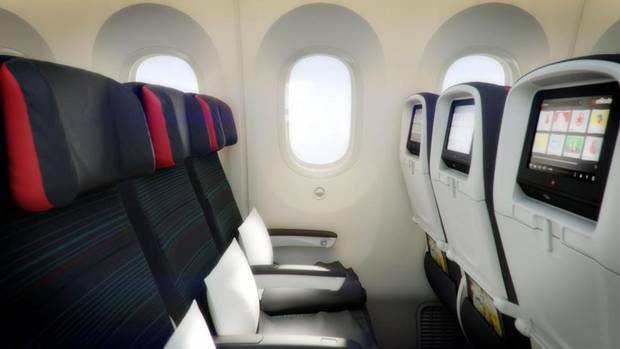 Power outlets, USB ports, touch handsets and retractable tray tables are provided with the seats. Air Canada claims that its Boeing 787 aircraft has the largest windows in the Business Class. The Premium Economic cabin on Air Canada’s 787 Dreamliner is designed addressing the needs of passengers for comfort and convenience in a precise fashion. It has a total of 21 seats arranged in a 2-3-2 order. 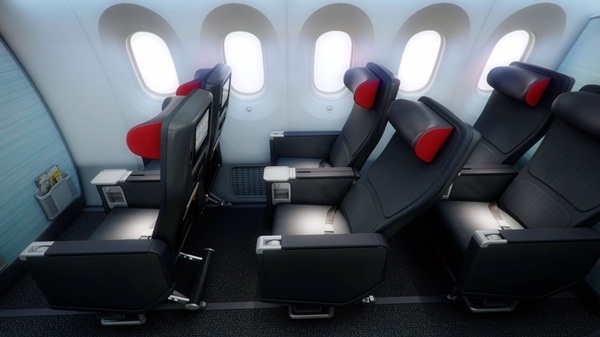 With 19.5-in width, 7-in recline and 38-in legroom, the seats are spacious enough to accommodate passenger comfortably. Each seat is accessorized with a HD touchscreen for audio-visual entertainment, a USB outlet and a power port. Priority check-in facility, premium inflight meals and complimentary bar service for the Premium Economic Class passengers add to the joy of flying with Air Canada. The Economy Cabin on Boeing 787 Dreamliner has got makeover too. It has a total of 210 seats arranged in a 3-3-3 order. The Economy Class seats are accessorized with 9-in high-definition, touchscreen personal entertainment systems. The passengers can access USB ports and power outlets at arm’s reach. Boeing 787 Dreamliner is a new-age, fuel-efficient aircraft having airframe made of composite materials which are light on the environment. Boeing 787 Dreamliner is stronger, harder, more durable and more efficient than Boeing 767 aircraft in Air Canada’s current fleet. The Boeing 787 Dreamliner promises a smooth flight with lower cabin pressure. Full ambient LED lighting in the cabins of Boeing 787 Dreamliner makes the body feel at home even in different time zones, which results in fewer chance for headache, dizziness and fatigue. The cabins are equipped with advanced filtration systems to keep the air clean and the atmosphere healthy inside. 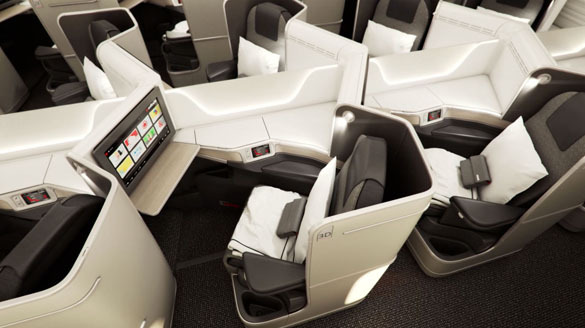 Ben Smith, Executive Vice President and Chief Commercial Officer of Air Canada, describes the overall cabin architecture as ‘contemporary’ and ‘sophisticated’. IndianEagle.com specializes in booking the cheapest flight online with Air Canada from Canada to India all the year round.